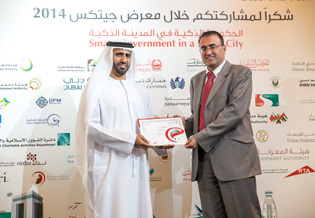 "Dubai Smart Government" honors "Orient Planet" for promoting its e-services & smart apps at "GITEX 2014"
The Dubai Smart Government (DSG) Department recently recognized Orient Planet for its strategic efforts to promote DSG's e-services and smart applications during "GITEX Technology Week 2014". Nidal Abou Zaki, Orient Planet's Managing Director, received an honorary certificate from the Department during a ceremony held at the InterContinental Dubai Festival City. Aside from Orient Planet, other partners of the Department were also recognized for making its participation at GITEX a huge success. DSG Director General H.E. Ahmad Bin Humaidan and Deputy Director Wissam Lootah attended the awarding ceremony along with delegates from various government agencies, media representatives, and other partners.